An easy, delicious gourmet tasting dish, using only 4 ingredients. Pre-heat oven or outside grill to 450 °F (220 °C). Cut the head and tail off of a gutted, cleaned trout. Place the minced garlic inside the open belly of the trout (add more than 4 teaspoons if preferred). Sprinkle mesquite seasoning and salt over the garlic and allow the belly to close naturally. Place the trout onto a sheet of aluminum foil and wrap the foil loosely over the trout so that it is sealed, but in a tent fashion. Place in the oven or grill for approximately 20 minutes. Check to see if the meat flakes. Do not overcook. 177 members have added this recipe to their cookbook. 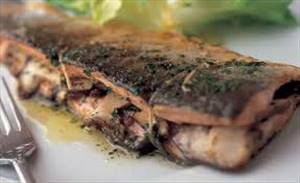 There are 275 calories in 1 serving of Mesquite Garlic Trout. Calorie break-down: 27% fat, 3% carbs, 70% protein.